The launch of their Ladies Summer Breakfasts in The Palm Court from 1 January 2015 is a great way to make the most of Durban’s fabulous weather and experience one of Durban’s most sought after breakfast destinations. From Monday to Thursday enjoy a Continental Breakfast including tea, coffee, fruit juice, Champagne and Oysters from 07:00-10:00 at R170 per person. The fabulous acoustic swing Jazz duo, Beat Route, are a new addition to the entertainment line-up in The Lighthouse Bar, with their first guest appearance on Tuesday 27 January from 18:00-22:00, followed by another on 24 February, 31 March and 28 April. Ringing a change for Valentine’s Day this year, The Oyster Box introduces a Valentine’s Singles Dinner on Friday 13 February. If you’re ‘flying solo’ this Valentine’s Day but still want to enjoy the occasion and have some fun, why not round up a few friends (involved or unattached) and join the Oyster Box’s Valentine’s Dinner for singles. It’s a great chance to still get into the Valentine’s mood and meet new people. The magnificent Pearl Room is the venue for the three-course plated dinner (at R590 per person) that includes live entertainment and an MC for the evening. 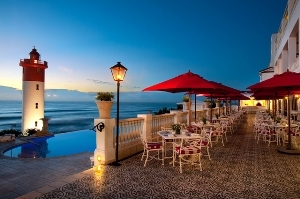 Always popular, Valentines Day Dinner on 14 February at The Oyster Box is one of the hottest dates in town. Both The Grill Room and The Ocean Terrace Restaurants will be pulling out all the stops with a selection of menus and live entertainment, ranging from R750 to R950 per person. Book early to avoid disappointment. The Oyster Box are thrilled to host the next KZN Food Heroes Dinner on Wednesday 25 February in the Pearl Room. An evening dedicated to recognising and celebrating the very best fresh product available in KZN, the event includes an entirely locally-sourced, five-course plated menu, live entertainment and a gift. Cost is R550 per person. The Curry & Comedy Evenings are now an institution on the Oyster Box’s social calendar. The first event for the new year takes place in The Pearl Room on Monday March 16, with the hilarious Aaron Mcilroy doing the comedy honours. At R390 per person, the menu includes a starter platter, the incredible Curry Buffet and a plated dessert. Don’t miss the chance to take part in a free Tutored Tasting of Bouchard Finlayson wines on Friday 27 March in the Hotel Lobby, from 18:00-19:00, before the Dinner service. Booking for both the tasting and dinner is essential. Fabulous weather and holiday vibes are on the cards for the Easter Weekend at The Oyster Box. An Easter-themed High Tea will take place daily from 14:30-17:00 from Friday 3 to Sunday 6 April in the Palm Court. The cost of R320 per person, includes a gift for each guest. Following a sold-out event on Secretaries Day earlier this year, Durban style-guru and dress designer Carol Clark, brings her newest collection back to the Pearl Room, with a fashion show, plated brunch and Pop-up shop. Join from 09:00 – 12:00 on Wednesday 22 April. Cost is R 390 per person. For bookings and more information on any of the events at The Oyster Box contact them on 031 514 5000 or restaurants@oysterbox.co.za.